We had shared at earlier blog posts on our experience onboard Costa Victoria 5D4N trip to Langkawi and Phuket as well as our meals onboard Costa Victoria. With thousands of passengers onboard, you will definitely need to queue for various things from boarding to disembarking. 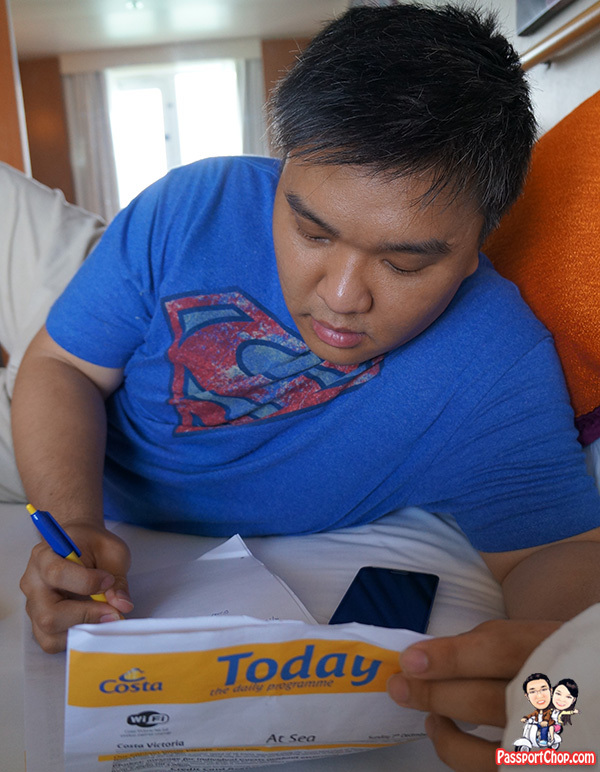 If you want to save some time queuing and waiting, I have compiled 11 tips to make this entire cruise experience a more enjoyable one. 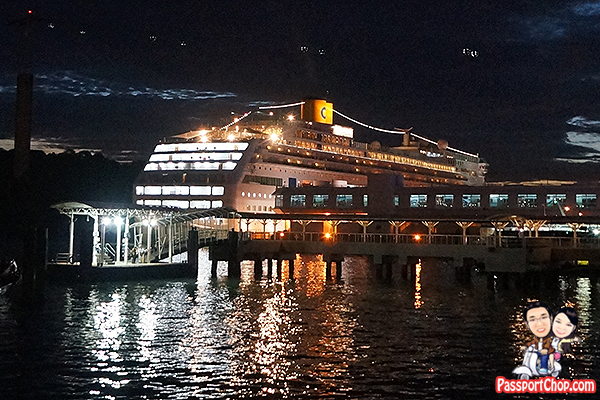 Our cruise (Costa Victoria) departs from Singapore Harbourfront Cruise Terminal at 10pm on Day 1. Embarkation starts from 4.30pm and last boarding time is at 9pm. We checked-in our luggage at around 6.15pm and was given a queue number of “27” which corresponded to a boarding time of 8.45pm! I guess that’s how Costa Victoria do crowd control – 6-7pm is typically the most crowded period since most passengers intend to enjoy their dinner onboard the cruise. My tip for you is that you need not necessarily wait until your assigned boarding time. We went up to the boarding area at around 7.45pm and there were no queues at all so we went through the paperwork e.g. passport and security checks and boarded Costa Victoria! 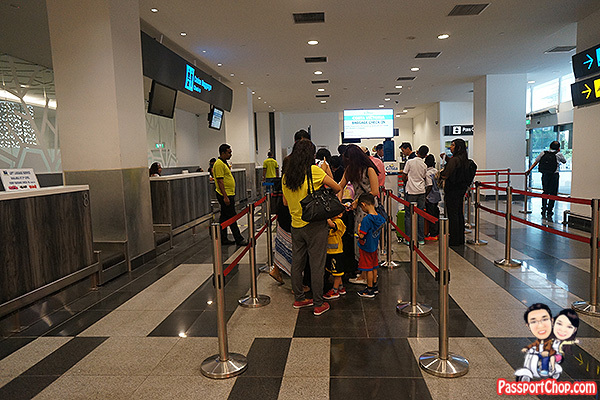 If there are queues, they will likely ask you to come back at your assigned boarding time. Ensure that you have printed out your Cruise Ticket. The last few pages of your Cruise Ticket are luggage labels with your name and cabin number. These luggage labels will be used to tag your luggage. If you don’t have your Cruise Ticket, it will take you more time to check-in and also print the pages with your luggage tags or else you will need to wait for the staff to collect luggage tags from somewhere else, label it and then tag your luggage. Do web check-in too – it will save you some time at the boarding counter as they will already have most of your passport information. This is the queue to check in your luggage at Harbourfront Cruise Terminal – if you are taking a taxi here, tell the driver that you are taking a cruise at Harbourfront (there is another cruise terminal at Marina South) so that he can drop you at the drop-off point nearer the check-in counters instead of at the Harbourfront Shopping Centre where you will need to walk for about 10 minutes to get here. 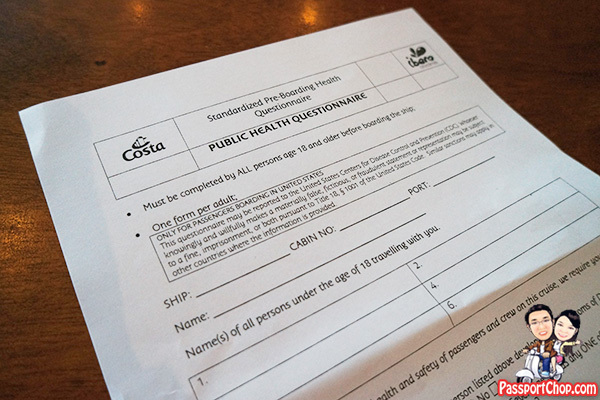 You will be required to complete a public health questionnaire – this will be issued when you check-in your luggage – do not lose this questionnaire and your boarding card (the one with your queue number as shown above). 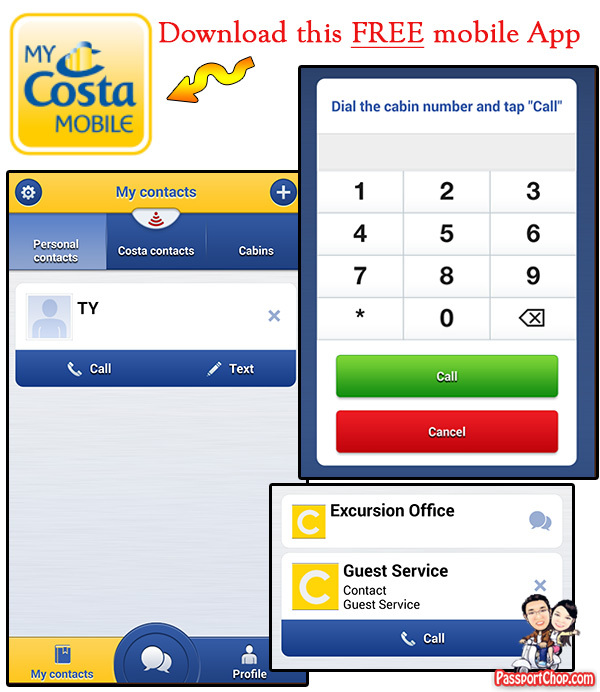 Before you go onboard Costa Victoria, make sure you download the myCosta app onto your phone. This app will allow you to tap on the Wi-Fi network onboard Costa Victoria to text message or call other guests onboard the same ship (who also have the myCosta app downloaded onto their phones) – the best thing is this myCosta app is free to download and there are no charges when you tap onto the onboard Wi-Fi to contact your friends (who are onboard the same ship as you) using the app. This is perfect especially if you are travelling in a big group of families/friends and you want to coordinate on schedules and meeting timings. The text messaging function works just like Whatsapp – you can add your personal contacts (just get the user ID that your friends register with their myCosta app). You will need to register for an account on the myCosta app – do note that you can only do so when you are connected to the onboard Wi-Fi. You can also call the Excursion Office and Guest Services using this myCosta app if you have any questions on your cruise excursions and special requests for your room e.g. additional pillows. Because Costa Cruises is an Italian company, the electrical sockets onboard Costa Victoria are all Italian ones – the 3 round holes in a line-type. 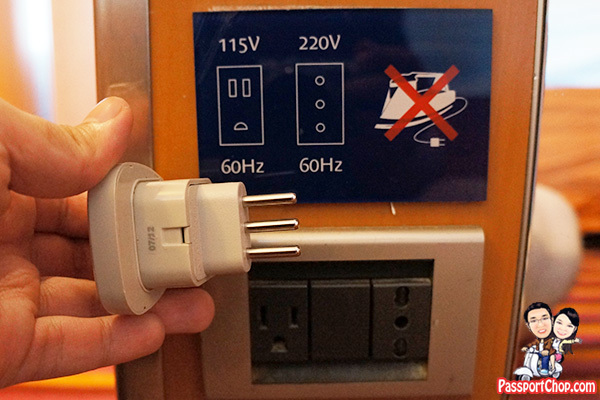 You can borrow an adaptor from Guest Services for free – they will charge USD 25 to your account which will be waived when you return the adaptor. Do note that you will need to return the adaptor by 11pm the evening before you disembark at Singapore so there will be a 15-hour window where you won’t have access to electricity to charge your laptops, phones and other devices. So bring your own adaptor and extension plugs if you need it. 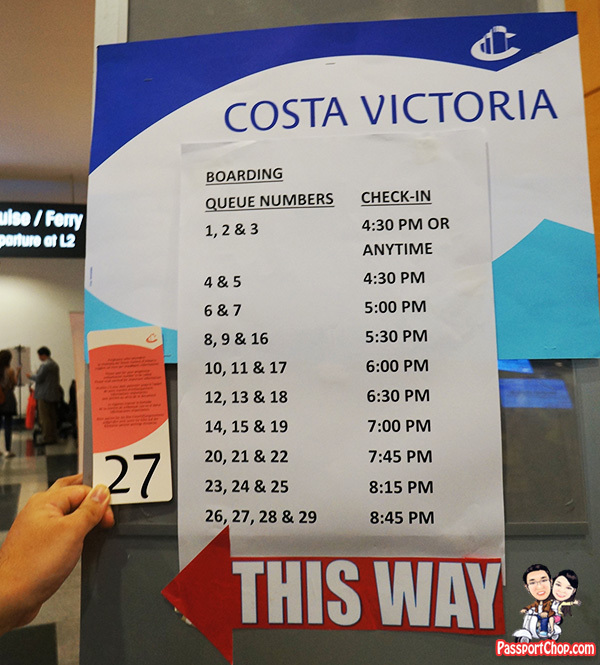 Costa Victoria conducts 2 of these briefings in various languages – once (in English) at 8.30pm after you board the ship and another time (in English) at 5pm the day before you disembark the ship. 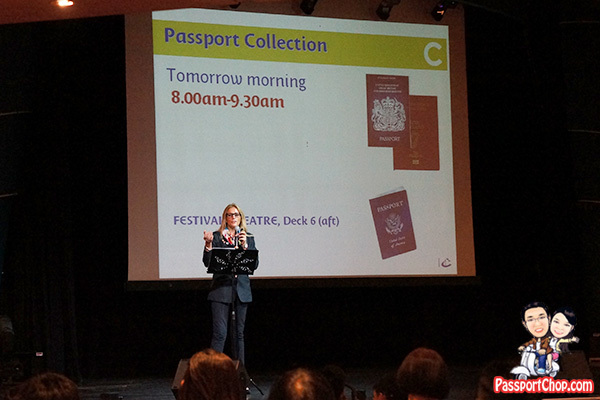 The host will share some administrative information, the itinerary and what to expect onboard Costa Victoria and for the disembarkation brief, what time you need to leave your cabin and what to prepare for disembarkation. It is not compulsory to attend these briefings (the emergency drill is compulsory for all guests to attend) and some of the information will be reflected in the Today daily programme. I strongly recommend that you attend the briefings as they provide quite useful information to help you get started for the cruise and the briefings take only about 15-20 minutes. All transactions onboard Costa Victoria e.g. shopping and casino games are cashless – just hand over your Costa Card to the staff and they will charge your payments to it. This is not exactly a tip since you don’t really have much of a choice in all you want to pay – only by Costa Card. Anyway, the Costa Card is very useful since everything is charged in USD so you need not bring a bunch of US dollars onboard if you are settling your bill by credit card. Do check if your cruise package that you paid for has taken into account gratuities. There is a compulsory daily service charge (gratuities) per guest for the duration of your cruise. If not, you should budget for the gratuities – i can’t remember the exact amount. I think is about US$10++ per day per guest (not per cabin!). 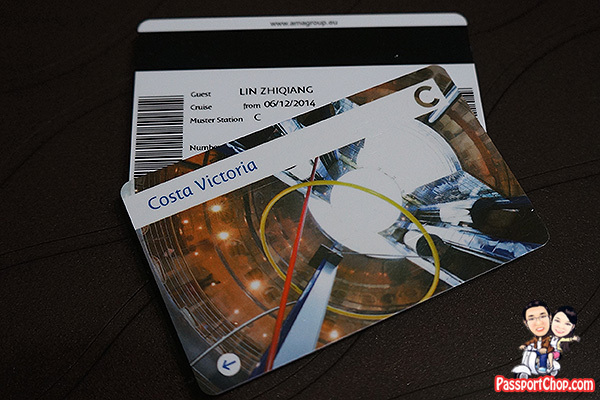 Your Costa Card is also your form of identification when you disembark and embark at Langkawi and Phuket for your day trips – your passports will be kept by Costa Victoria. So don’t lose your Costa Card. In the case of emergencies onboard the cruise, you can also find the information for your Muster station (where to gather) – see picture below, in my case, it is Muster Station C.
If you intend to do some shopping or gambling onboard Costa Victoria, make sure you register your credit card at one of these self-service credit card registration machines at Deck 5 and 7. Do so within the first 24 hours of embarkation – I tried registering later than that, it won’t work and the guest services counter is often unable to help you with the registration due to “network” problems. The reason why you need to self-register your credit card is so that you can avoid long queues on the last day of the cruise when everyone is required to settle their outstanding accounts on the Costa Card. 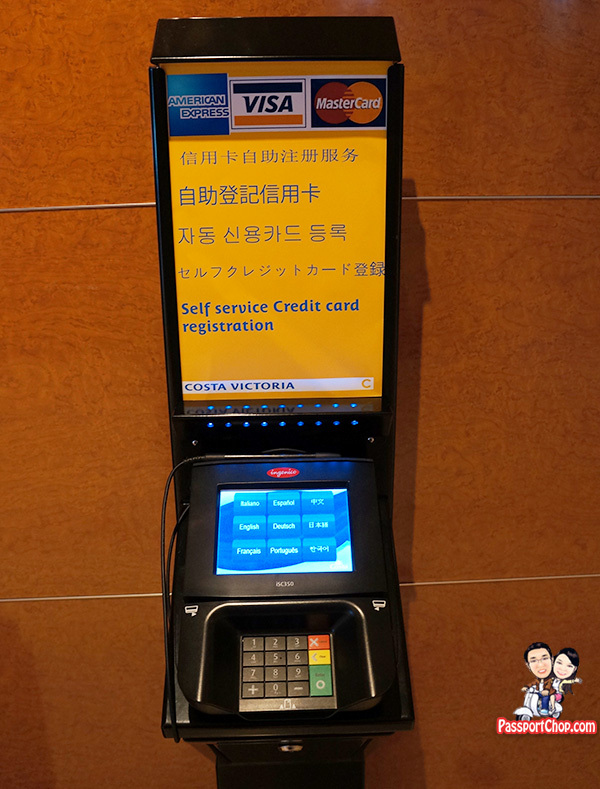 Even if you intend to pay by credit card, you will still have to endure long queues to settle your bill (if you had not register your credit card at the machine earlier). If you had registered your credit card successfully within the first 24 hours, then you need not bother with the queues. Your bill will be placed in your cabin – check that the amount reflected is correct and no further actions are required. Your registered credit card will be billed directly by Costa Cruises. 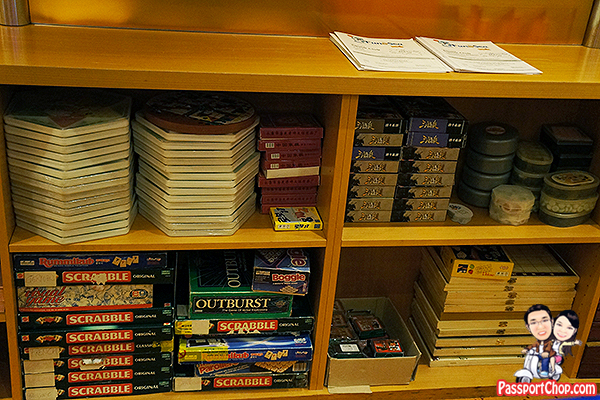 Yup you can rent board games for free – they will charge a deposit on your Costa Card which will be waived when you return all borrowed equipment. I think there is a charge of US$1 for the ball to play at the foosball table – i think you can play infinite number of times with that ball you paid for (I guess one since I didn’t buy/rent one and the ones who did seem to hang out at the foosball table like forever). As explained in my post on dining onboard Costa Victoria, indicate you preferred dinner timing early with the maitre d’. 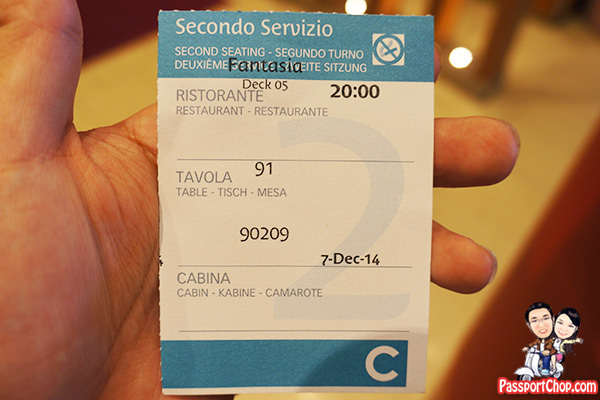 There are two sittings for dinner at Fantasia and Sinfonia Restaurant – 5.45pm and 8pm and you can only enter at the sitting timing that have beeen assigned to you. If you have having a buffet dinner, then no need to worry about the sitting timings (as they only apply to ala carte dining). 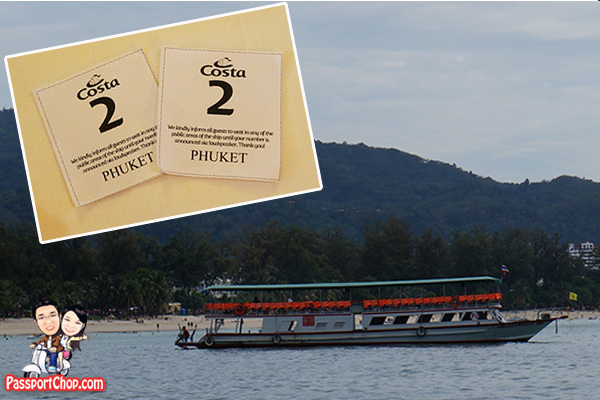 If you did not book a shore excursion with Costa Cruises and you want to be one of the first few to disembark for your day trip in Phuket, then you should queue up early for the tender boat ticket. The plan was for Costa Victoria staff to start distributing tender boat tickets at Festival Theatre from 2.30pm onwards on Day 2 of the cruise. I started queuing at 2pm and was one of the first few. By 2.30pm when the doors open, there was already a long long queue formed. Groups will be called in sequence by the number of their tender boat ticket to disembark the cruise ship. Even if you start queuing at 2.30pm for your tickets, I don’t think you will disembark quite late because the schedule indicated that Groups 1, 2 (which I was in), 3, 4, 5, 6 will disembark at 8.30am (the earliest timing) and the last group (from Group 21 onwards) will disembark at 10am. So in summary, if you want to be really the first few to disembark, then you should queue for your tender ticket 30 minutes before they start distributing. If you are not in a rush, then just go at 2.30pm. The journey from the cruise ship to the pier (at Kalim Beach in Phuket) takes 20 minutes and the last tender boat from shore to ship is at 6.30pm. There will always be tender boat leaving the ship at regular timings until 5.30pm. Thanks for Great sharing!!! This is awesome… keep up the good work guys!! Many thanks! Appreciate your detailed sharing! God Bless you and family. I’m traveling with 2 wheelchair bound n I young man with walking disabilities. May I ask how they are transferred to the tender boats? I was told it wasn’t convenient. Hi! Do you happen to know the rates for the wifi packages? Also, if another credit card was used to book my trip can I register another credit card to my costa card? Thanks! i am not sure abt the wifi rates – you can check with costa customer support. You can register another credit card to your costa card. Hi thanks for sharing – very much appreciated. On the 1st day, do we disembark in Singapore or do we just stay on the ship? I see some excursions being offered by Costa Cruise for Singapore? it depends on your cruise schedule. do you mean day 1 of your cruise (before even the cruise departs Singapore). If so, you are free to explore singapore until boarding time. Hi there! If I do not have a credit card, will a debit card work as well?? Hi there, may I know how to pay the service charges to the crew? As my travel agent is not paying on my behalf..
Are there kettles provided onboard ? As I read somewhere the cruise only provides free beverages but not plain water..
1. I read that beverages and food are not allowed to be brought on board? I’m a bit concerned about this as I’m travelling with young children. Do they provide food 24 hours a day? As for free water do they provide that in the rooms? 2. We are thinking of moving around on our own in Phuket. How near is the boat drop off from the places of attractions eg shopping and food places? The drop-off is very far from the main shopping and food places – bargain with a tuktuk to get your family to the shopping areas. Bargain hard! Under that no kettle provided but is there any hot water provided from the dispenser? or we can request for it? i didnt need hot water during the cruise but i think you can request for it from your butler. Can I ask do they give free wifi on board? Is there anything to do or shop at the beach of stop over in Phuket if we choose not to move beyond the place? Hi. When the cruise back to Singapore Harbour front at 2pm on Day 5. How long it takes to check out/ leave the cruise? I need to arrange someone to fetch me. it depends. they assign everyone a departure card that shows where you are in the queue to get off the ship so it can be very long considering that there are over 1000 guests onboard. Hi for the tender boats to Phuket I pay USD hiw much as in cash to the Operators or charge to costa card ? Can we walk from tender boat to Patong Beach ? Or do we need to call TukTuk and how much does it cost for that? And where tender boat apprach in Phuket? Hi. You mentioned no kettle in normal room and that means we have to bring traveller elect kettle for my grandchild feeding milk. Hi ..we have to pay gratuity on board the ship. May I know is magnetic strip needed as I need to activate my dBs card is is it just the normal swipe like the one done in NTUC when we purchase our grocery? Thanks. I followed your 11 tips to the T during my trip in Nov 2017. They were extremely helpful because it’s a sea of confusion the moment I reach Harbourfront cruise terminal. Terrible. You might want to add that upon checking into the ship, the costa cards, ala carte dining tickets, ship’s programme, luggage etc are already in the cabin. Finally Costa has taken feedback……there is a kettle in the cabin. We are arriving Singapore from Manila around 11AM on the day of embarkation. Would you know if we can do early baggage-check-in at Harbourfront at 12PM, as we want to do a quick sightseeing to Marina Sands (without our luggage) before embarking the ship at 6PM. Appreciate your soonest response. Thank you! 1) Can Costa on board credit be used to pay for the daily service charges? 2) Can Costa on board credit be encashed through the slot machines in the casino? Did Costa allow anyone to remove or adjust the daily service charges, and tip the crew directly?